The Great Liberal Death Wish | The only conservative book that predicted Barack Obama's reelection. The only conservative book that predicted Barack Obama's reelection. There is a crisis of leadership in this country and The Great Liberal Death Wish addresses the problem. If you are sick of presidents learning on the job, of Congresses that pay no attention to the public, of an establishment media that never brings critical intelligence to the issues, then read this book. The premise of The Great Liberal Death Wish is that the political class and its elite media colleagues are out of touch not only with the American people but with reality. Decades ago, British author Malcolm Muggeridge described the political and intellectual elite of his time as dupes who had fallen into a kind of paralysis on many issues. They were weak, without values, and incapable of meeting the challenges of the day. What was true in Europe those decades ago is now true in the United States. After nearly forty years, neither government nor private enterprise in the U.S. can devise an independent energy policy for the nation; federal and state deficits run into the trillions as far ahead as anyone can calculate; immigration, both legal and illegal, is so out of control that within decades the U.S. population will swell to half a billion, with the majority becoming a minority; federal and state judges act as unelected legislators, running roughshod over federal and state constitutions, creating what amounts to judicial dictatorship; the presidential primary system has degraded presidential nominee selection to such a degree that politics has become entertainment, with the best TV performer sent to the White House – job experience not being a factor. Worst of all, the same political class that cannot defend our borders, our culture, or our values, is now allowing every little dictator in the world to build nuclear weapons and the missiles with which to deliver them to any target on earth (including any American city). The Great Liberal Death Wish argues that a philanthropy/permissiveness mode of thinking is characteristic of the elites in America and that explains their inability to recognize, much less respond effectively, to the challenges of our time. It amounts to a kind of decadence. Fortunately, new electronic modes of communication, a newly energized voting public (the tea party and other movements) and a sharply critical appraisal of events by talk radio and cable TV news offer hope for change and reform. We do not have to have presidents as clueless as Jimmy Carter and Barack Obama; nor presidents who commit felonies in office, as Richard Nixon and Bill Clinton did. We do not have to have presidents so inexperienced that they blunder into wars that last for years and kill hundreds of thousands. We do not have to be shackled by political correctness carried to absurd extremes or taxed beyond the ability to pay. Term limits and age limits can be applied to members of Congress and to federal judges (it should have been done long ago). Party discipline can be restored so that the parties nominate their leaders at conventions rather than relying on an “American Idol” kind of TV exercise disguised as “debates.” The self-nominated would have little hope in a system more like those in Australia, Britain, Canada and other democracies where a politician with a resume as thin as that of Barack Obama would never have a chance at national leadership. The Great Liberal Death Wish provides historical overview of four major problems and makes some sensible suggestions for reform. It is critical of both major political parties. Politics reduced to entertainment, immigration, court activism and the proliferation of nuclear weapons are the issues discussed in this book. it is just about the only conservative critique that predicted the reelection of Barack Obama. Read it, discuss it, get active yourself – regardless of political orientation. Only when voters are more active and politicians are held to account will there be real reform and change. 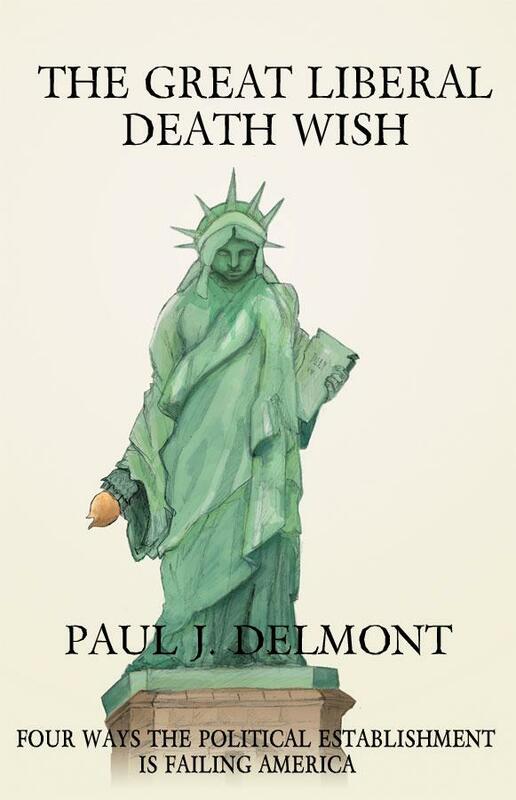 The Great Liberal Death Wish by Paul J. Delmont, PhD, a veteran journalist and historian, is now available in trade paperback and e-book from Amazon.com/Kindle.